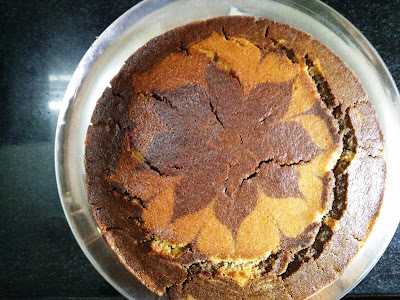 Try this eggless easy & delicious chocolate cake made in cooker. One more design for this cake!! 1 . Add sugar, yoghurt & milk in the mixer & prepare smooth mixture. Take it in a big bowl. 2 . Add slowly Suji & maida in that mixture. Add desi ghee & vanilla essence. Add warm milk if required & prepare a smooth batter. Add baking powder & baking soda & mix properly. 3 . 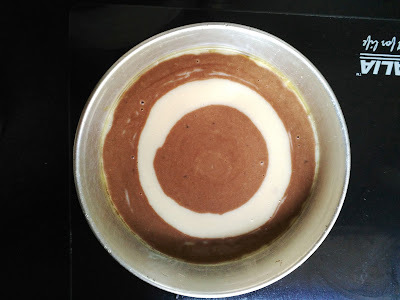 Transfer half of the batter in another bowl & add chocolate powder & mix well. 4 . Preheat the cooker. Put the cooker stand at the bottom. 5 . 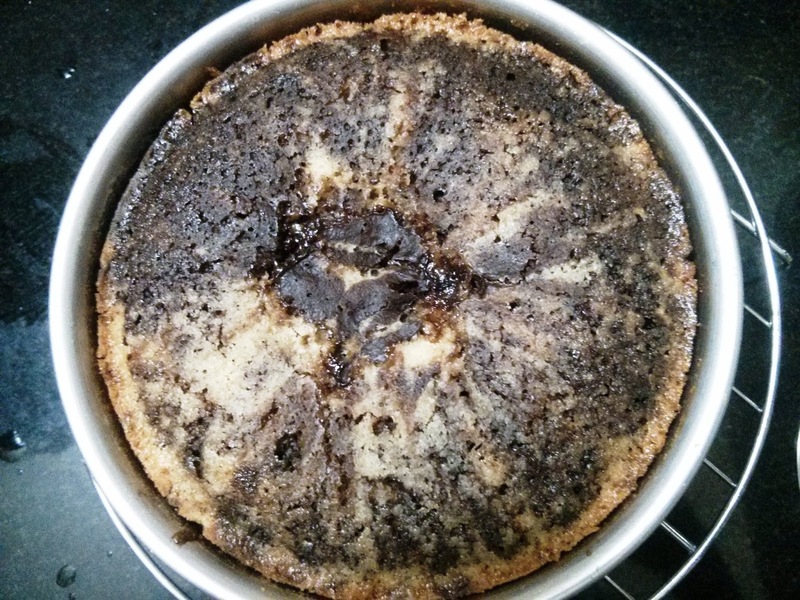 Grease the tin with oil or desi ghee & sprinkle some maida on it. 6 . Pour one layer of white batter in the tin. 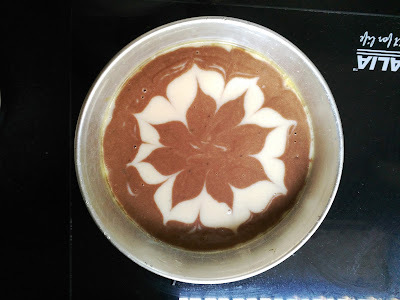 Then above that lay the layer with the batter containing chocolate powder. 7 . Likewise prepare the tin till both the batters finish. Tin should be filled upto 3/4 part only. 8 . Keep the tin in preheated cooker & close the lid without whistle. 9 . Cake will be ready in 35 to 45 minutes. 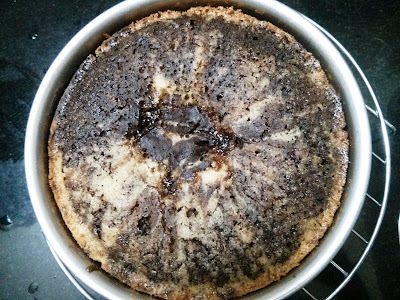 You can bake the cake in the oven at 180 C for 35 minutes. 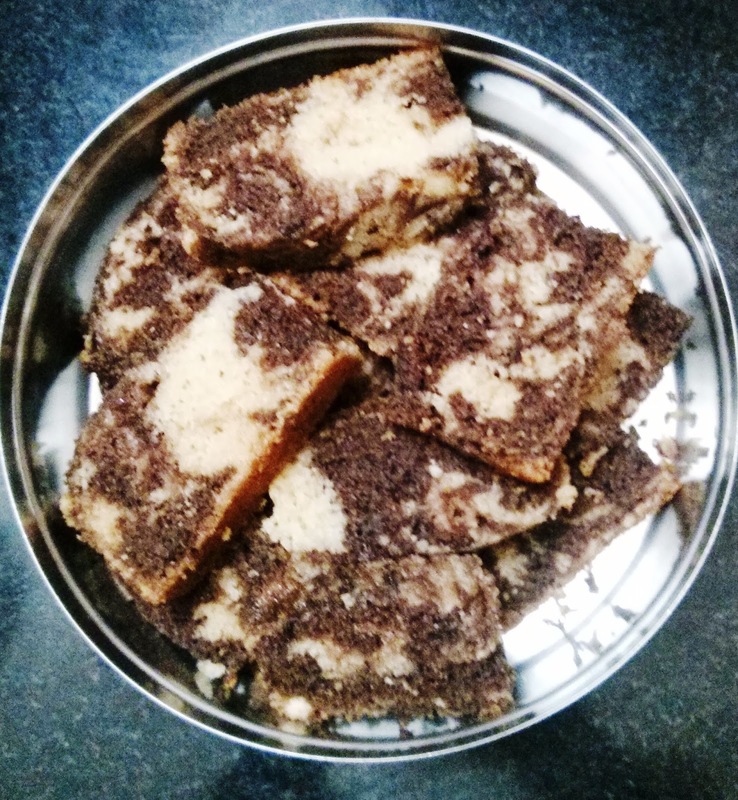 Cake recipe sounds easy and yummy. Before I try this, I have a few queries. Should we put water in the cooker. And should we keep the cake batter open or cover it while cooking. I will surely try this and let you know how it turned out. No you should not add water in cooker. I use heavy bottom cooker. Otherwise use aluminium cooker. Batter should not be civered. Try this cake turns out v yummy. All the best!! Hi. While cooking in convection oven pre heat it @180° and then bake for 35 mins? CAN WE USE AMUL BUTTER INSTEAD OF DESI GHEE ?